The Minister for Finance, Michael Noonan TD, and the Minister for Public Expenditure and Reform, Brendan Howlin TD, announced Budget 2016 yesterday afternoon. The Budget saw the introduction of a range of tax cuts and spending increases worth €1.5 billion, with €750 million for additional public service expenditure included. Here are some of the key measures which will impact people and families with disabilities. Extension of Free GP Care scheme to all children under 12. Continuation of Prescription Charge at €2.50 per item. Maintenance of thresholds for the Drugs Payment Scheme, medical cards and GP Visit Cards. Commitment of €35 million to mental health and suicide prevention services. Allocation of €940 million funding in 2016 for the Fair Deal nursing home scheme. Expansion of Speech and Language Therapy (SLT) and Occupational Therapy (OT) services for children, with €8 million funding support. Restoration of Respite Carer’s Grant – which is to be renamed as the Carer’s Support Grant – to €1,700 in 2016. Extension of payment of Carers Allowance, following the death of the person being cared for, from six to twelve weeks in January 2016. Reintroduction of Christmas Bonus for social welfare receipients at 75% of the weekly payment rate (thus standing at €141 for those receiving a €188 weekly payment). Increase of threshold for Family Income Supplement by €5 per week for families with one child and by €10 per week for families with two or more children. Introduction of Disabled Drivers Fuel Grant scheme in 2016, benefitting 12,000 people and costing €10 million in the year. Rise of minimum wage from €8.65 to €9.15 per hour from January 2016. Increase of €5 per week to the Child Benefit Allowance from January 2016. Rise in the Fuel Allowance of €2.50 per week. Increase of €3 per week to the Old Age Pension from January 2016. This does not apply to those in receipt of the Invalidity Pension or the Blind Pension. Addition of €€3 million funding for Free Travel Scheme, bringing total budget to €80 million in 2016. Inclusion of €25 a quarter in support for water services for people with disabilities and carers. Introduction of two weeks of paid paternity leave from September 2016. Addition of €2.50 per week to top-up payments for Community Employment, Rural Social Scheme, Gateway and Jobbridge programmes. Provision of €500 million in 2016 to support enterprise agencies. Increase of €200 to the tax credit to carers in the home, bringing it to €1,000. The income threshold for home carers is also set to rise from €5,080 to €7,200. Changes of €6 million to the Universal Social Charge (USC), with a new entry point of €13,000 introduced. Three bands are to fall from 1.5% to 1%; 3.5% to 3%; and 7% to 5.5% respectively. Introduction of new Pay Related Social Insurance (PRSI) tax credit of €12 per week for low-paid workers. Allocation of €15 million to facilitate the full participation of children with disabilities in the Early Childhood Care and Education Scheme (ECCE). Introduction of free pre-school education for children aged between three and five, until they reach primary level, under the ECCE. Creation of an additional 20,000 school places. Recruitment of 2,260 teachers, including 600 extra resource teachers to support children with disabilities and special education needs, but at the same reduced individual allocations as in recent years. Extension of Community Childcare Subvention Programmme by up to 8,000 places to support parents in low-paid employment or training. Reduction in pupil:teacher ratios from 28:1 to 27:1 in primary schools and from 19:1 to 18.7:1 in secondary schools in September 2016. Enabling of enrollment of children in pre-school at three different times in the year: September, January and April. Supply of over 9,500 social housing units by 2018, with over 3,100 to be provided in 2016. Provision of 450 units for people with specific needs in 2016, as part of €76 million allocated to Capital Assistance Scheme (CAS) to meet housing needs of vulnerable groups. Delivery of 20,000 residential units by the National Asset Management Agency (NAMA) by the end of 2020, at a cost of €4.5 billion; 75% will be houses, and 90% will be in the Greater Dublin area. Provision of an addition €17 million for emergency accommodation of homeless people, bringing total budget to support people affected by homelessness into long-term sustainable housing to €70 million. Piloting of affordable housing pilot scheme through €10 million made available by sale of Bord Gáis Éireann. 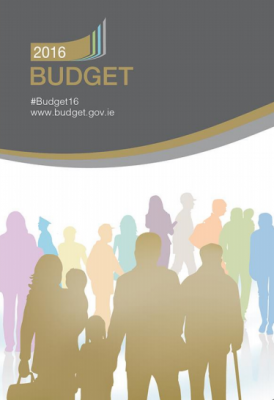 To access Budget 2016 in full, please click here.